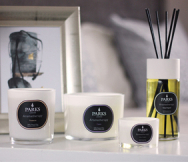 The Parks 30cl Myrrh candle is not only a perfect holiday-themed gift, it is a lovely hand-crafted aromatherapy grade candle which can help promote a calm, focused and thoughtful mood in anyone who experiences its delicate, natural scent. Myrrh is, of course, one of the three traditional ‘gifts of the Magi’, that the three wise men presented to Jesus at his birth. However, its history as a luxury fit for kings goes back much further. It has been used as a perfume, and incense and even a medicine for many thousands of years. Even today, myrrh is used as a gentle antiseptic and analgesic, and is often mixed with wine to form a spicy tonic. Aromatherapists tell us that not only does the scent of natural myrrh help calm jangled emotions and focus scattered thoughts, they speak of its warming properties, and its ability to fight the spread of germs, and promote healthy skin, or to treat pain and swelling. The myrrh in our candles is derived using traditional methods, including steam distillation of the essential oil from resins responsibly harvested from wild myrrh trees. This is combined with the best 100% natural waxes available, yielding a clean-burning, soot-free burning mix which imparts no extra fragrance or heaviness to the air. That mixture is poured into a delicate glass mini vase around one of our finest smoke-free cotton wicks. The result is a unique candle with a distinct, powerful scent that burns for as many as 50 continuous hours, or many months of occasional use.